Etsy Dallas' Spring Bash, a premier handmade shopping event and party, showcases the very best in handmade apparel, bags, jewelry, home décor, accessories, art, pottery and more! Hand-picked artists, crafters and designers from near and far will all gather at the Bash for pure shopping pleasure. A crowd favorite, the Etsy Dallas Spring Bash will offer up the popular and highly coveted Bash Bags™ for the first 50 adult shoppers in line when we open to the public at 10:30a.m. These reusable tote bags – chock full of handmade products – have become a thing of legend, and shoppers have been known to arrive three hours early to stand in line for one! The Bash is a juried, handmade-only show. No resale items, no vintage, no commercial products, no supplies at the Bash. All artists must be present to staff their own booth during the Bash. If you have staff that is knowledgeable and trained to sell your products, please let us know at the time of application if they attend in your absence. Artists are not allowed to sell another artist's products. Artists may not sell any trademarked or copyright items unless they show proper licensing agreements to the jury at the time of application. Artists may sell only items on their application in order to avoid over saturation of categories, to be fair to fellow vendors, and to provide shoppers with a diverse array of products. Artists do not have to live in the Dallas area nor be a member of Etsy Dallas to apply. We welcome artists from all over the country! Applicants do not need to have an Etsy shop, but quality web presence is highly encouraged. Complete applications and application fees are due by midnight (CST) February 27, 2019. A $25 application fee is non-refundable and can only be sent via Paypal when you submit your application. In order to be considered, you must provide a working web link depicting clear photos of your handmade products. No photos accepted via email or snail mail. This year we will host the event in an indoor venue with multiple rooms. We cannot guarantee placement in any location at time of application. If your preferred booth size is not available, please indicate on application if you would/not be willing to accept your second choice. There is no "cushion" around the perimeter of the booth. You get exactly your booth space, no more. Please plan accordingly. Double booths and shared booths are not available at the Bash. Each artist will receive free electricity if you bring your own labeled 25 ft three-prong extension cord and power strip. The Bash will provide only the outlets and electricity. Only 60W (or less) lights, laptops and credit card machines are allowed. No radios, no heaters, no disco balls, no lights greater than 60W. April 7: All print-ready press materials due (if you have chosen a sponsorship level, your digital files will be due upon acceptance to show). Six promotional packages are available to artists selected to participate in the Bash. These are optional, but a great way to potentially acquire press coverage. Payment for promotional options are non-refundable. See below for our 2018 web and social media presence. (1) Press Photo Pool: FREE! Each artist in the Bash is expected to submit one image to the Bash Press Pool. The Press Photo Pool aids the press in covering the event and its artists. Photo requirements will be emailed upon acceptance. Do not send pictures now. (2) BASH BAG™ PROMOS: FREE! We encourage all vendors to provide either 25 or 50 promo items for our incredibly popular Bash Bags™. Acceptable promos include: magnets, hair pins, bookmarks, earrings, coasters, pins, product samples. All promos are subject to approval by Bash organizers. Business cards and coupons/flyers alone will not be accepted. This is optional but strongly encouraged. Bash Bag Contributors business name and website link will be included in Bash Bag™ spotlight blog post. Bash Bag™ items must be received by the date on the timeline above to be included. Items will not be returned. Do not send items now. All of the above (1 press pool photo, opportunity to put items in the Bash Bags™). Accepted vendor's shop name will appear on the Bash Bags™, a reusable shopping bag that is both sold and used for giveaways at the Bash. One (1) Instagram Post on the @etsydallas Instagram account. Submit an additional three (3) hi-res product photos to be placed in the Press Photo Pool for the press to access. One (1) Facebook Post on the Etsy Dallas Team Facebook page promoting your shop. One (1) Twitter Post on the @etsydallas Twitter account promoting your shop. Your 150 x 150 logo+link will be placed at the top of our Artists page as a "Featured Artist." PROMOTING THE BASH - SPREAD THE WORD! Web art will be available for each vendor to use on their website, blog, Facebook, Twitter, and elsewhere online. We expect each vendor to do his or her part to promote the show. When you promote the show, people come and spend money! The $25 application fee is non-refundable. No exceptions. The Bash jury is made up of volunteers - artists and crafters and shoppers just like you. Because we have more applicants than space in the show, the jury chooses Bash artists based on space availability, category, need, quality, uniqueness of product, past participation, and web presence. If you were not accepted into a past Bash event, we encourage you to apply again. The dynamics and needs of a show change every year, but we cannot offer specific feedback. Submitting an application and paying the non-refundable $25 application fee does not give you automatic entrance into the Bash. It affords you the opportunity to be considered for participation in our event. The jury is made up of local artists just like you who do their due diligence in looking at every single application and considering every single artist who has applied to be in the show. 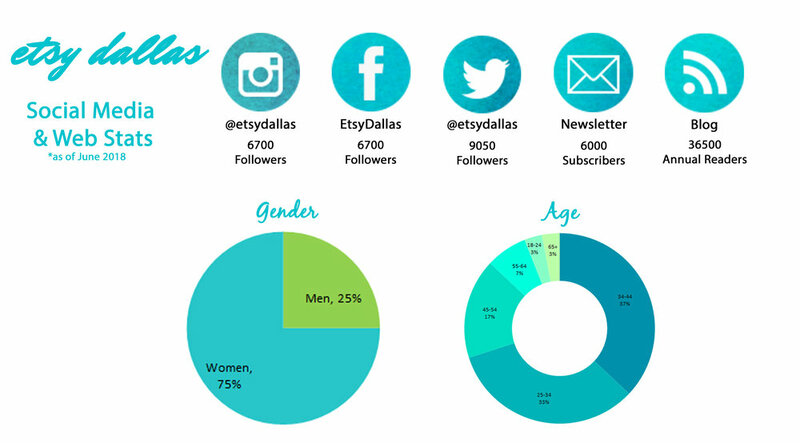 Partnering with Etsy Dallas for the Bash is a great way to maximize and promote your business. There are six sponsor levels to choose from - perfect for any budget! Learn more about sponsorship packages by visiting our Partners page or by contacting one of our team leaders via email: etsydallas@gmail.com. The Bash is organized by an all-volunteer team. Etsy Dallas members participating in the Bash will be required to volunteer. More info to follow. Non-members are invited to volunteer as well! Know of someone who'd like to volunteer at the Bash? We will have volunteer opportunities available.